We’ve heard yelling in every country—in Hungarian, Italian, French, Portuguese, German and Spanish—but when we are on a court in Jerusalem and the yelling is between Jews and Arabs, there’s a new level of heat. Walking down the white-washed streets of Jerusalem, you pass Muslim women wearing burkas and Hassidic Jews wearing top hats, ringlets of hair drooping down past their ears. All three major religions believe their faith has roots in the Old City. While space and territory are big issues, every quarter has found room for a football court. In the Christian Quarter, kids wearing replica jerseys—from Messi to Van Nistelrooy—play goalie-wars on bleached stone. In the Jewish Quarter, guys with yarmulkes pinned to the back of their heads play on a field overlooking the graves on Mount of Olives. 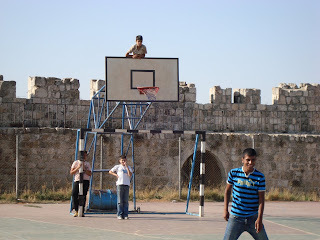 In the Muslim Quarter, players scrimmage on a court lining the fortified wall of the Old City. There are no nets so it’s not always easy to tell whether a goal is a goal and when Luke scores, the Jews and Arabs can’t agree whether or not it went in. When they are crowded in the box, pointing fingers and gesturing angrily, some clasping their yarmulkes in hand, some pointing outside the post, some pointing within the post, there’s the sense that they’re arguing about more than this game, that they’re also yelling about yesterday’s terrorist attack and tomorrow’s never-ending mistrust. On the other hand, is-it-or-is-it-not-a-goal is a fight we’ve had all over the world, a sign of being swept up in the game, and there must be some relief in arguing about football instead of the overwhelming history of crimes against each other. They want to know whether the ball went in. Then comes the realization that we have it on tape. Two separate swarms of men charge Rebekah. In the rest of the world, we’ve been able to fend off similar demands for a repaly, as rewinding tapes while shooting can be a headache. But these guys don’t hear us say ‘no.’ Their hands are up to the camera like they are ready to rewind it themselves. Rebekah gives in and their heads crowd around the LCD screen until they see it and disperse in continued disagreement—even the replay is unclear. Once our team is off, Luke and I sit in the center of the divide. The right side of the court is full of Jewish men, their thumbs slung through the belt loops of their black dress pants. The left side of the court has been left to a family of ten or so Arabs, who sit along a wall and use a wristwatch to keep track of the ten-minute games. “So do you guys play here a lot?” I ask a bald man with a large stomach. “I am here under doctor’s orders,” he says, tapping his gut. Immediately, the entire family marches over to the Jew side, laughing, put their arms around guys’ shoulders, shaking hands, and saying, “Shalom.” I notice one Jewish man’s face. He is frowning and it’s hard to tell whether this is out of distrust or is just an effort to show the seriousness of the matter—if he’s going to shake this guy’s hand, he’s not going to laugh about it, he’s going to give it the gravity it deserved. The Arabs and Jews sit uneasily together for the remainder of a ten-minute game, and then they drift back to their earlier sides. Our flight to Cairo leaves Jerusalem at 7:45 AM. We’ve heard that the Israelis take security seriously, and when we arrive at 4:40 AM, more than three hours before our flight, we feel pleased with ourselves. The airport is staffed by the Israeli Defense Forces and there are brisk, beautiful, twenty-year-olds serving their mandatory duty and asking us hard questions. Luke says four at the same time I say three. We feel guilty all of a sudden, scrambling to clarify that while we’ve been together for three, we’ve know each other for four. The soldier looks hard into our faces and slaps a number two sticker on the back of our passports. Ryan and Rebekah are faring less well. “You are not a couple?” No. “But you used to be?” No. “But you date?” No. It is apparently a very suspicious thing for a male and female to travel together if they are not romantically connected. The Israeli government does not believe in being just friends. Ryan and Rebekah’s passports receive a number five sticker. When they are being thoroughly frisked for a half an hour, their bags entirely disassembled, we know that is better to have a number two. Once we have endured the hour-long investigation, we coast to the carry-on security, operating under the false impression that we are in the clear. Luke and I thoughtlessly drift to one checkpoint, leaving the suspicious, just-friends number fives on their own. We feel glad we arrived more than three hours early. But when it gets closer and closer to our boarding time, we decide to head to our gate. On the other side of the airport, Ryan and Rebekah have spent the last two hours undergoing questioning and getting their carry-ons dumped all over the investigation room. Though we have two identical cameras, only one of them set off an x-ray machine. “Probably, if it went through again, it would not go off…but now we must check and make sure.” At first, they said they could not get our other bags off the airplane so Ryan and Ferg scrawled out a note to be hand-delivered to us, telling us to get on the plane without them. We never receive the note. Security then decides there is time to offload our bags. “Would you also like us to offload your friends?” As we never got word that we were suppose to get on, there was never any need for us to be offloaded. Frequent flyers, we are used to feeling screwed by airports, but we are also used to getting some scrap of compensation, a meal voucher hastily thrown your way…it is hard for us to grasp that it is possible for them to simply not let us on our flight and not be willing to put us up in a hotel and not be willing to get us onto another airline and not be willing to refund our ticket. The x-ray machine made a stray beep and now we had no way to get out of Israel. Upon examining the bus route, we discover that we will not be allowed across the border because over-land-routes require a pre-existing visa. All Royal Jordanian flights for the next three days were booked and unless we can convince the security to forgo the 24-hour investigation and let us onto the night flight, we’re done for. By five pm, we are sitting at the gate and the board is once again flashing “Final Boarding Call.” No one has delivered our camera. Our bags really are on this flight so Luke and I go ahead and board. Royal Jordanian is doing everything they can to help us. The pilot announces to the flight, “Alright folks we are already to go, just waiting for two passengers who got held up in security.” Another ten minutes goes by and Luke and I are staring anxiously out the window until we see a black SUV peel around the corner. Ryan and Rebekah breathlessly emerge. Glad you had good time is Jerusalem. The security guards at the airport sure know how to screw Israel’s tourist economy. A fabulous description. Pretty sad that such search procedures are so necessary. Thank goodness you all didn’t have to take a bus to Cairo. That would be a movie all by itself. so exciting!!! just like the book i’m reading now. and it had a good ending. Very nice post, i never seen any where this much interesting post, you have done really a great work, each picture is describing own story by self, i hope we will see more new stuff soon. Great description of Israeli airport security. Dead on! I had a similar experience in the Jerusalem airport, except a man inspected my crotch for minutes on end, not my camera. Security was somehow also surprised and threatened by women speaking in Arabic on film. Apparently they didn’t know that 30% of Israel’s population speaks Arabic as their native language.